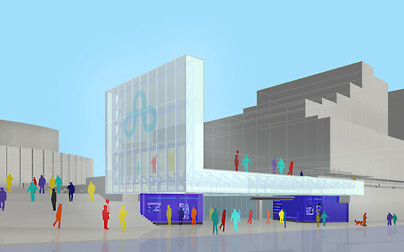 A juried competition to re-invent the Ste-Catherine street entrance to Place des arts, Montreal including a signature architectural element and illuminated panels showcasing the various companies and events at Place des arts. Our proposal for a new entrance to Place des arts was a response to a competition problem defined as a ‘project de signalisation’ and puts forward a different attitude towards identity. In reaction to the noisy visual vibrancy of St. Catherine Street we chose a strategy that was minimal in its content but powerful in its overall effect. From a distance the marquise acts as a signal of a different and singular kind of cultural space in the commercial mix. Up close the marquise forms a grand entrance and shelters an information wall where details about events is available. This dual function as urban emblem and centre for cultural information were key responses to this challenge. This winning design was subsequently developed to pre-construction stage. The project was not built due to budget cutbacks.